Kayak Campo is a family business and the instructors and staff are an important part of the family. We have licensed professionals chosen for dynamic personality and their perspectives in live. 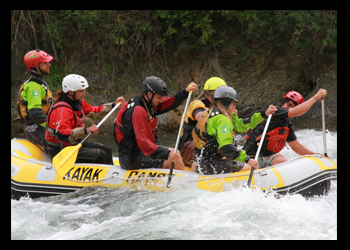 Each instructor brings their own way of teaching and their knowledge; each guide brings the techniques and the ability to spread fun in the river. All of them are guides and kayakers with experience. Our operations team is the backbone of Kayak Campo. They are the nice voices on the phone, and the friendly faces that greet you on your arrival. They coordinate programs and answer any questions you may have. Logistics staff makes the activity work perfectly. Each member of this team work to ensure that your experience with Kayak Campo is unforgettable!